I guess in Pokemon Omega Ruby and Alpha Sapphire, the sky is not the limit. The new Fly ability allows our Pokemon trainer to hunt among the clouds, but a new trailer reveals that this generation will also be taking us out of this world! We've been to many places before in the Pokemon series, but have we ever been to outer space? Seriously, this is epic on a whole new scale. A mission in Pokemon Omega Ruby and Alpha Sapphire charges out hero with stopping an asteroid from colliding with the Hoenn region, and only his Mega-Rayquaza can stop it! It's been a while since I've played Ruby, but did this happen in the Game Boy Advance game? I don't remember it, and it seems like something that would stick out in my mind. 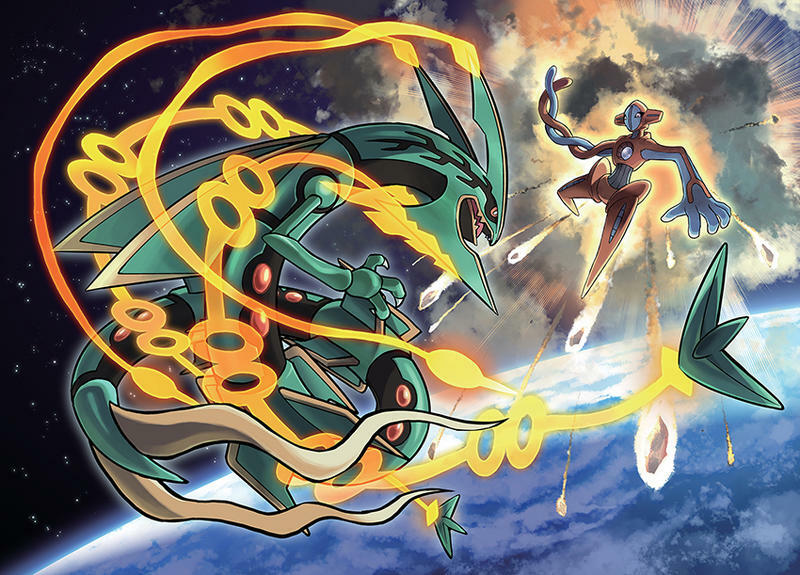 When in space, the trainer and his Rayquaza meet returning Pokemon Deoxys, confirmed for appearance for the first time, and as an epic battle back-dropped by the incoming asteroid! Seriously, just watch the trailer. Other introductions include a new character named Zinnia, new allies, and new legendary Pokemon in the Mirage Area: Entei, Raikou, Suicune, Uxie, Mesprit, Azelf, Cresselia, Heatran, Cobalion, Terrakion, Vzirion, Tornadus, Thundurus, and Landorus. Regirock, Registeel, and Regice can also be captured to unlock a brand new Pokemon, Regigigas! All of these new additions make Pokemon X and Y look cute by comparison. Some claimed that these previous games didn't change up the formula enough despite the 3D world, but with all I've seen from Pokemon Omega Ruby and Alpha Sapphire, this could be the real deal! Check it out of Nov. 21 for the Nintendo 3DS.